In the interest of full disclosure, it seems only fair that I start off this review by noting that I’m a total sucker for two specific types of movies: ones set on Halloween and ones starring the incomparable Nicolas Cage. Needless to say, when I heard that Cage was starring in a supernatural thriller that just so happened to be set on Halloween night, my interest was immediately piqued in a big way. Directed by Uli Edel, Pay the Ghost centers on Mike Lawford, a professor who’s so busy with work that he often neglects his young son Charlie. Hoping to make things right, Mike brings Charlie to a Halloween parade in the city, but things take a turn for the much, much worse when the boy seemingly vanishes into thin air. One year later, Mike begins to solve a Halloween mystery that just might bring his son back. There are very few movie lovers on this planet who don’t have a fondness for Nic Cage, be it a genuine appreciation or an ironic obsession, and the reason for that is because Cage is the sort of actor who is ALWAYS fun to watch – even when the movies are bad and even, and perhaps especially, when the acting isn’t so great either. Cage often makes the movie, and this is true of Pay the Ghost. Cage’s performances over the years have varied from over-the-top crazy to subdued and serious, and Mike Lawford is a character that mostly keeps the actor from going off the rails. Lawford is a dull character, to be sure, and this movie in particular would’ve benefited from a wacky Cage performance, but there’s something about Cage, even when he’s not fully going for it, that is endlessly endearing. And in comparison to other Cage movies in recent years, which have led many to question his Oscar win, he’s actually pretty good here. A fusion of supernatural spook-show and mystery thriller, this one in many ways feels like the sort of horror movie that would’ve been made back in the late 90s, though there’s undeniably a whole lot of modern influence at play. The story of a man trying to rescue his son from an alternate dimension, Pay the Ghost is a mish-mash of ideas culled from recent genre favorites, notably Sinister and Insidious. Though the storyline was mostly aped from those aforementioned films, the Halloween vibe alone makes Pay the Ghost stand out from the pack of other imitators we’ve recently seen. Using the well-known history of the holiday itself, writer Dan Kay – who based his script on the novel by Tim Lebbon – weaves an interesting story within that, tying a web of child abductions directly to the overall mythology of Halloween. Particularly if you have a deep love for All Hallows’ Eve, it’s quite interesting. 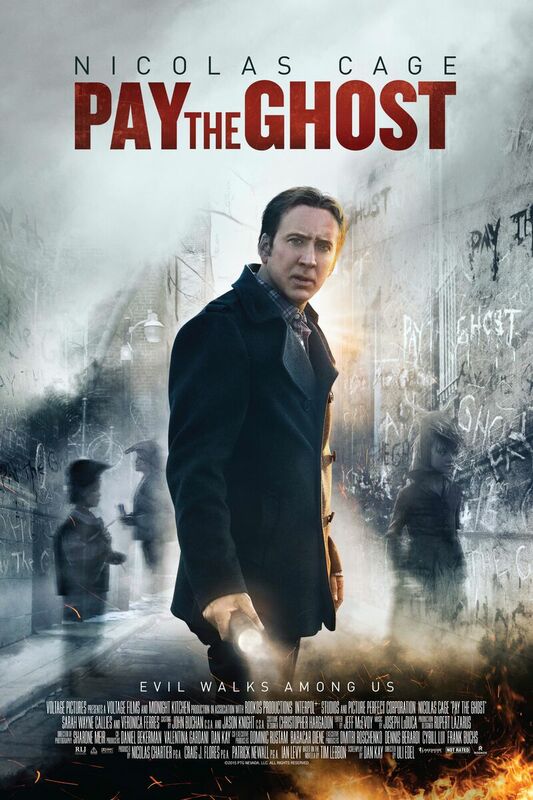 At its best when it’s more of a thriller, with Nic Cage making puzzled expressions and trying to figure out what’s up, Pay the Ghost is at its weakest when it’s directly lifting scares and spooky images from much better horror movies. Thankfully, the film really finds it stride in the final act, when things get suitably bonkers and all involved embrace the inherent b-movie cheesiness only exploited in small doses prior. Without giving anything away, Pay the Ghost‘s finale is a spectacle of both genuinely striking imagery and endearingly shoddy CGI, and though it’s a shame that the previous 75 minutes are so often lethargic, derivative, and quite dull (Sarah Wayne Callies is particularly lifeless as Mike’s wife), there’s some real inspiration going on in those final moments – and they save the film from being instantly forgotten. I’m not going to sit here and pretend Pay the Ghost is a horror film you should rush to see, as my own interest in the movie never rose much higher than moderate amusement, but if you’re looking for cheesy fun, and the idea of Nic Cage starring in a Halloween horror movie sounds appealing to you, then I don’t think I’m misguiding you in the least by suggesting you cuddle up on the couch with this one. Thanks mostly to a bonkers final act and a fun performance from Cage, Pay the Ghost is an enjoyable little Halloween movie that’s tailor-made for October consumption. Grab a pumpkin beer and enjoy.